ViewPoint (Discontinued) | VIAVI Solutions Inc. The ViewPoint Data Management System is the first ever server, software, or hosted platform to unify testing, troubleshooting, and monitoring of an entire MSO’s plant operations into one comprehensive management solution. The ViewPoint platform provides operations managers with a convenient, easy-to-use platform for verifying field operation compliance while monitoring the performance of your forward and return paths. ViewPoint also has the capability to monitor the historical performance of all of your MIB (management information base) devices and proactively diagnose issues before they affect your plant by using Proactive Network Maintenance (PNM) metrics and trending. ViewPoint displays all of this information using convenient, easy-to-use dashboards powered by an extensive selection of customizable reports. The monitoring, reporting, and proactive network maintenance tools provided within ViewPoint give operators an unparalleled view into the overall health of their entire system from a single, consolidated platform. The ViewPoint system not only works for management, but is also designed with the technician in mind. The simplified web-based user interface of ViewPoint allows users to quickly and easily seek out problem areas within your plant either from the office using a PC or in the field from any portable smart device with an Internet connection and web browser. These mobile reporting features within ViewPoint allow you to view your data anytime and anywhere. 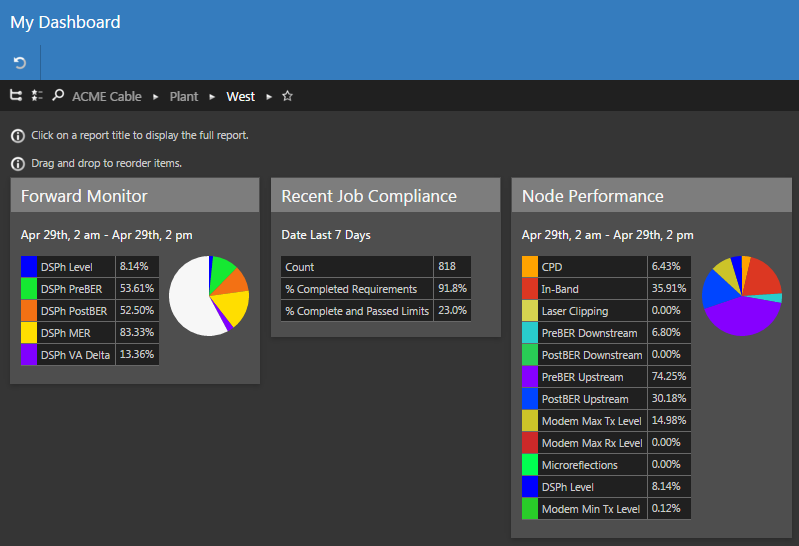 Technicians in the field also have the ability to use ViewPoint’s customizable reports that can display a continuously updating dashboard with poorly performing nodes so they can always be targeting the most critical problem areas within your plant. Additionally, with mobile connectivity managers can also see a quick view of their entire field operations at-a-glance, in near real-time without interrupting their normal work routine. By using the ViewPoint Data Management System to monitor the health of your plant, it can lead to improved team communication, finding and fixing issues before they become problems, and the ability to diagnose reoccurring problems over time. When combined, these features provide operators with all of the tools needed to reduce truck rolls, lower operating costs, and improve service quality. The My Dashboard feature within the ViewPoint system provides users with the ability to save their favorite reports to a common dashboard. This dashboard also acts as the user’s home screen, which allows quick navigation to their favorite reports or areas of interest with a single click. The organizational structure within the ViewPoint system provides supervisors with the ability to easily customize the software to match the MSO’s operational structure. 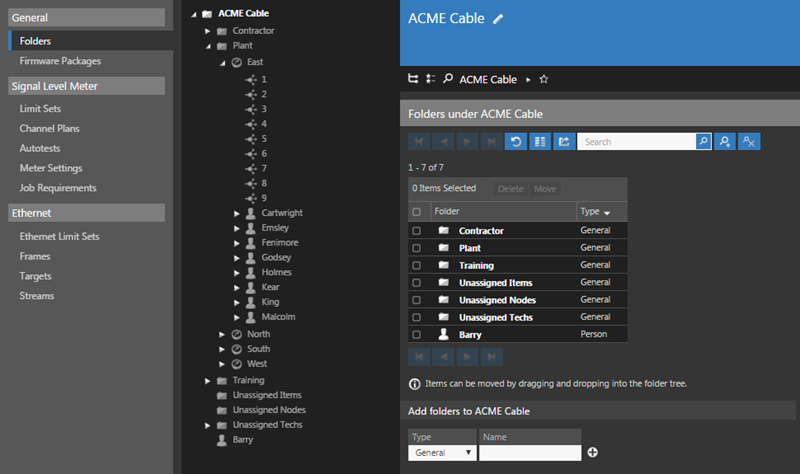 With customizable folders, areas, people, technicians, fiber nodes and return monitoring nodes, the organizational possibilities are nearly endless. The user can quickly navigate within the organization using a “bread crumb” trail or an easy-to-use tree structure to navigate anywhere within the system in just a few clicks. 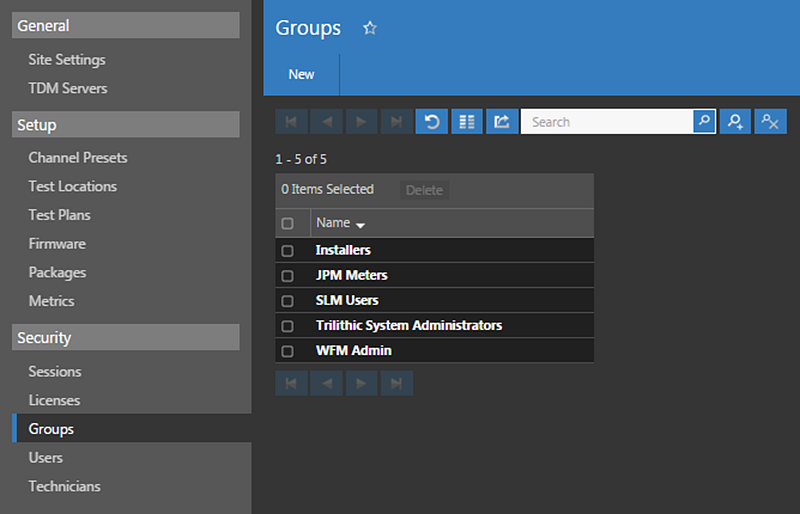 Comprehensive user management features allow supervisors to control user profile info, passwords, group membership and organizational access within ViewPoint. Additionally, supervisors can use group permission sets to control user access to specific features within ViewPoint including profile info, meter settings, jobs, reports, dashboards, metrics, live spectrum views, return monitors, watch lists, CMTS, modems, and site administration. Within ViewPoint, supervisors have the ability to manage all of their Trilithic test, measurement and monitoring equipment. This allows you to easily keep track of your assets to determine which units are operating normally and identify those in need of upgrades or calibration that may affect their measurement accuracy. The ViewPoint WFM Module is designed to unify an entire MSO’s field installation, service, and maintenance operations into one convenient platform. This system provides managers with the ability to easily verify installation certification compliance throughout the entire plant and help to identify both localized problems and high-level system issues. Whether by home, system, region, division, or even at a corporate level, these insights allow the operator to make better decisions based on a clearer understanding of the impact to overall operations and the associated ROI. The ViewPoint Return Path Management (RPM) Module simplifies the management of your return path monitoring and maintenance using Trilithic’s 9581 SST Return Path Analyzer. The RPM Module displays the percent over limit for each return path measurement metric and node monitored by the 9581 SST. The RPM module’s simplified dashboard provides operators with the needed flexibility of being both a master report dashboard for supervisors and a web portal for technicians in the field to view return path performance directly on their smart devices or PC. The ViewPoint Managed Information Base (MIB) Performance Indexing (MPI) Module is specifically designed to provide the NOC (Network Operation Center) with the capability to poll modems in real-time for up-to-date diagnostic information. This information is combined into a simplified dashboard that automatically displays each area’s MIB Performance Index, or MPI. The MPI module provides operators with the needed flexibility of being both a master report dashboard for supervisors and a web portal for technicians in the field to view modem performance directly on their smart devices or PC. The ViewPoint Proactive Network Maintenance (PNM) Module is specifically designed to provide the NOC (Network Operation Center) the capability to use your cable modems as troubleshooting devices by analyzing their pre-equalization data for any indication of potential impairments in your outside plant. By using active cable modem data, operators can automatically identify potential problems affecting their upstream and work to correct these issues before they impact customers. The ViewPoint Forward Path Management (FPM) Module simplifies the management of your forward path monitoring and maintenance. The FPM Module displays an entire system of 860 DSPh Remote Headend Analyzers within one simplified dashboard that automatically displays each area’s percent over the limit. The FPM module gives the operator the flexibility to be used as a master report dashboard, as well as gives the technicians in the field a web portal to pull live views of active forward nodes directly to their smart devices or PC. Return Path Maintenance (RPM) Module: For use with the 9581 SST for monitoring reverse and forward path HFC network spectrum. Work Force Management (WFM) Module: For use with the 180 DSP, 360 DSP, 720 DSP, 860 DSPi & 1G DSP meters for remote access to channel plans, auto test, and firmware updates, supports data uploads via the Internet for measurement data and work order management tracking. MIB Performance Indexing (MPI) Module: For use with the medium to large deployments of online cable modems and set top boxes for in-depth live monitoring view of online cable modems and set-top boxes throught the RF network. Forward Path Maintenance (FPM) Module: For use with the 860 DSPh for monitoring the forward path HFC network spectrum. THE VIEWPOINT ENTERPRISE SERVER ALLOWS A MAXIMUM OF 5000 HARDWARE CONNECTIONS TO THE WFM MODULE, 500 HARDWARE CONNECTIONS TO THE RPM MODULE, AND 50,000 CONNECTIONS TO THE MPI MODULE. THE VIEWPOINT ECONOMY SERVER IS LIMITED TO A MAXIMUM OF 20 DEVICE CONNECTIONS PER MODULE. REQUIRES A MINIMUM OF ONE SERVER MODULE PER INTEGRATED SERVER PACKAGE. INCLUDES MAINTENANCE & SUPPORT FOR FIRST YEAR OF OWNERSHIP, AFTER FIRST YEAR OF OWNERSHIP A YEARLY MAINTENANCE & SUPPORT FEE APPLIES.